I have been meaning to use this image to make a decorative plate. This past weekend, I finally had a chance to work on it. I cut the photo image to fit the inner circle of the plate, then used collage to attach the photo to the plate. I used dark brown tissue paper to create the border. I sealed everything with acrylic so the image won’t fade. Old photos and keepsakes can be such a good way to keep memories alive. If you have a photo that you would like to rescue or a memory you would like to celebrate, we would love to help you.! This is a Memory Imprints project that I recently completed. I started with two photos sent to me by the clients. These were well-loved photos, but the color was quite faded. The clients asked me to add color, and then mount the photos on jute board. I started by scanning the images into the computer, and got to work. After some basic retouching, I made the two photos the same size so they would look good together. Then I used Painter’s digital pastel to “hand-paint” the color back into the photos. Once I knew that the clients were happy with the color, I printed the images. Then I mounted them on some canvas boards that I had covered with jute, painted front and back with an “earthy” blue-green. I added these wooden stands for easy display. This is a keepsake box that I made recently. 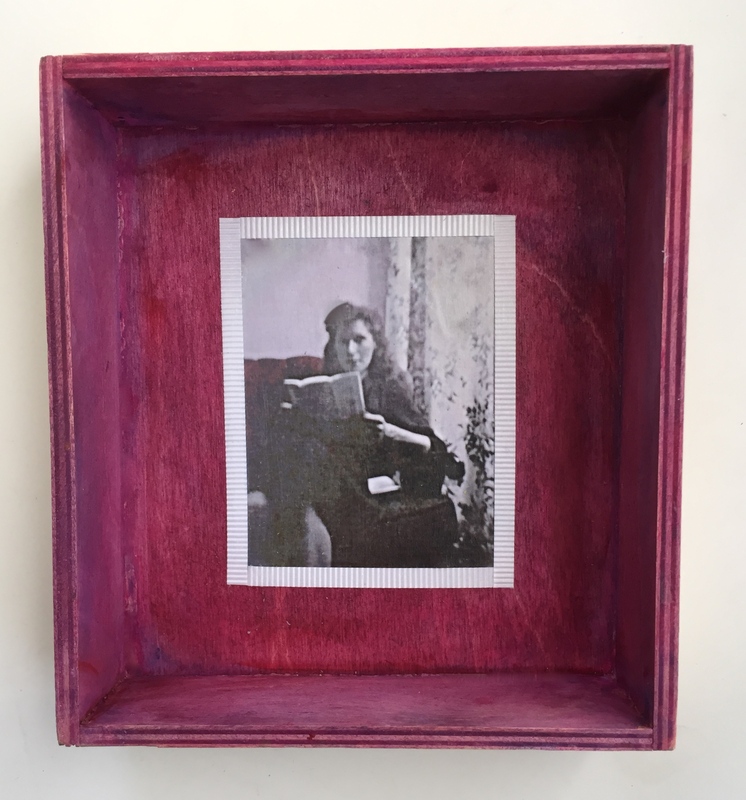 This hand painted box is decorated with a photographic image and a ribbon border. 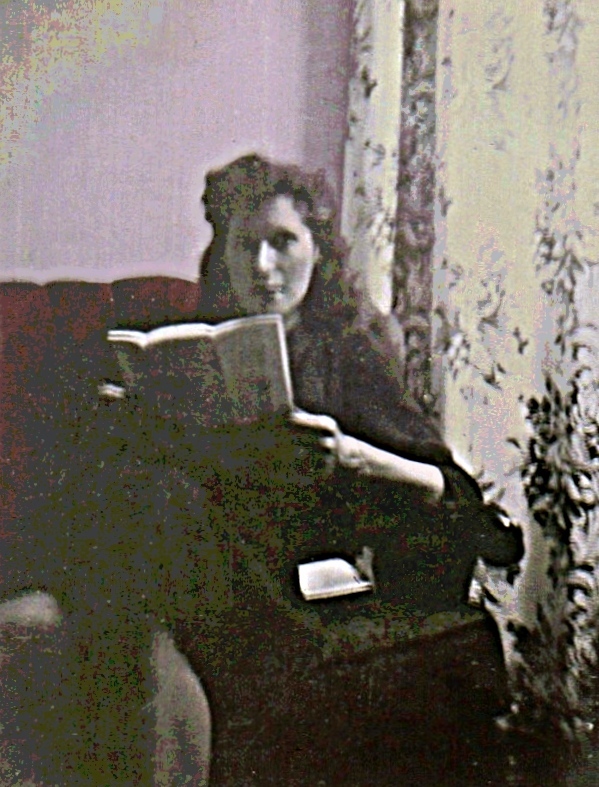 The image is a picture of my mother reading a letter. When I first came across this photo, it was a small black-and-white snapshot, out of focus, and scratched up. 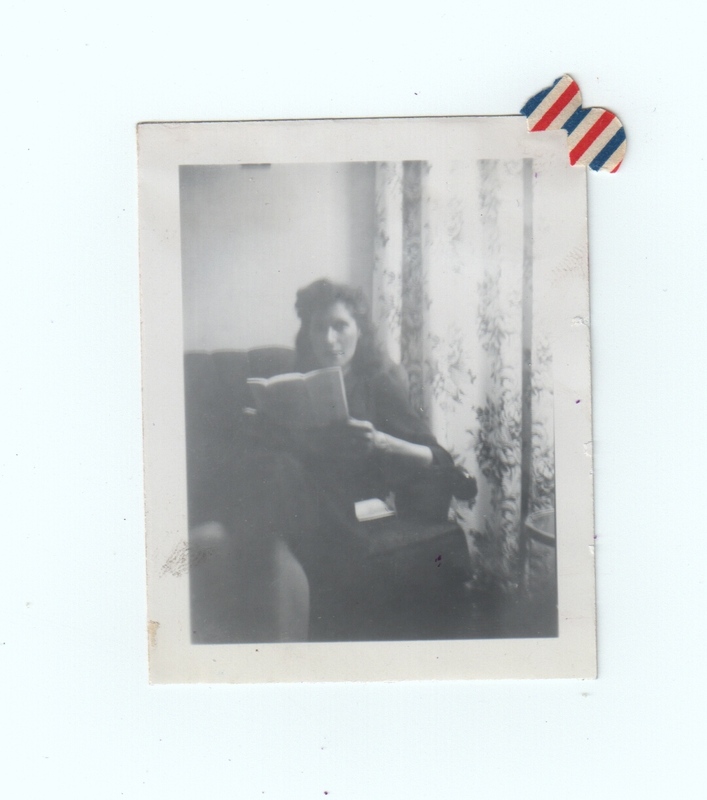 But I loved this image of my mother in the 1940’s, probably reading a letter from my dad, who was overseas. So I used some digital tools to rescue the snapshot. Then I had fun adding color, drawing from imagination and memory. The best part about doing a project like this is that it makes me feel as though I am spending time with my mother, even though she has been gone for 30 years now. Here is a project that I made last year around Mother’s Day. (You can sign up here for our workshops to learn how to make your own.) 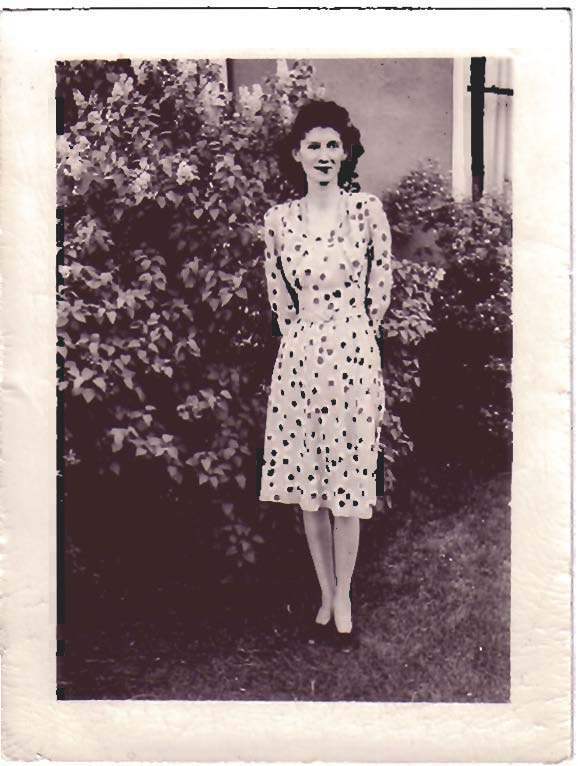 The image began with a snapshot of my mother that I found in her photo album. 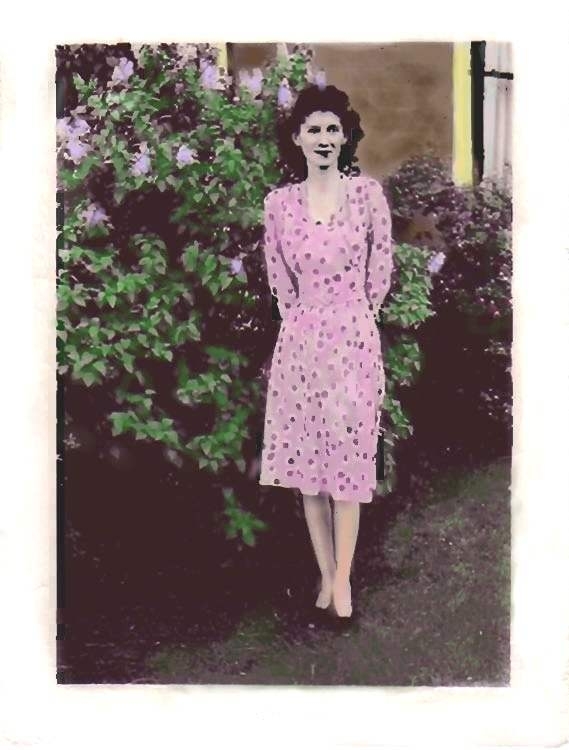 She is standing in front of the lilac bush and the house where I grew up. This is one of my favorite pictures of her. The original photo was a black and white snapshot, only 2 inches by 3 inches. (See below). A few years ago, I used Painter to enlarge it and to create a digitally modified and colorized version, also posted here. 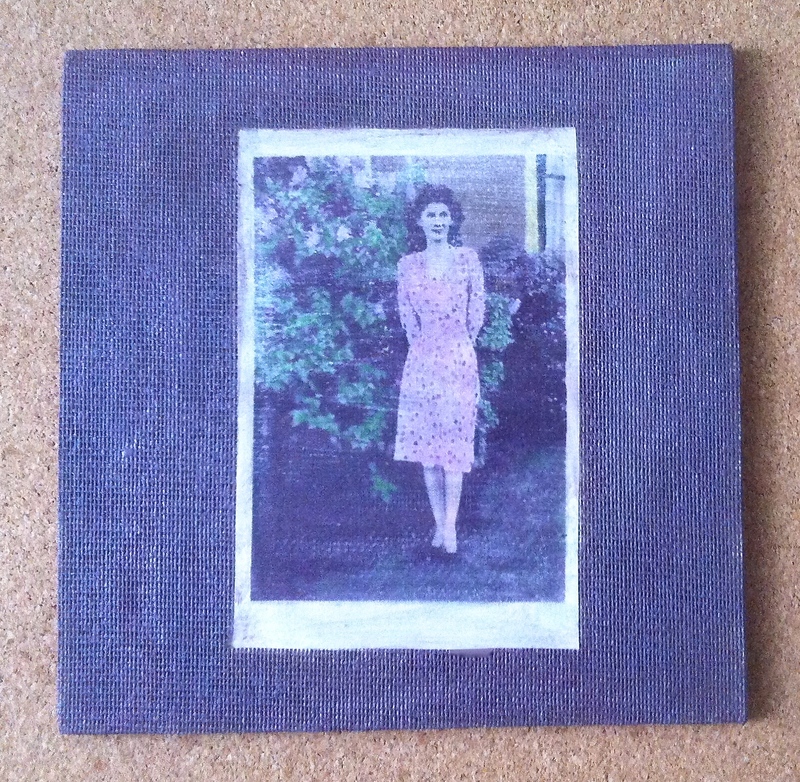 To make this project, I made a print of the image and then decoupaged it onto a jute-covered masonite board. I covered it with gel medium and pressed it down to get the texture of the fabric to show through. Then painted the fabric with a muted lilac color. I wanted something with the faded look of a memory. It’s nice to have this keepsake to remember my mother, who loved lilacs in the spring.